Hi everyone! 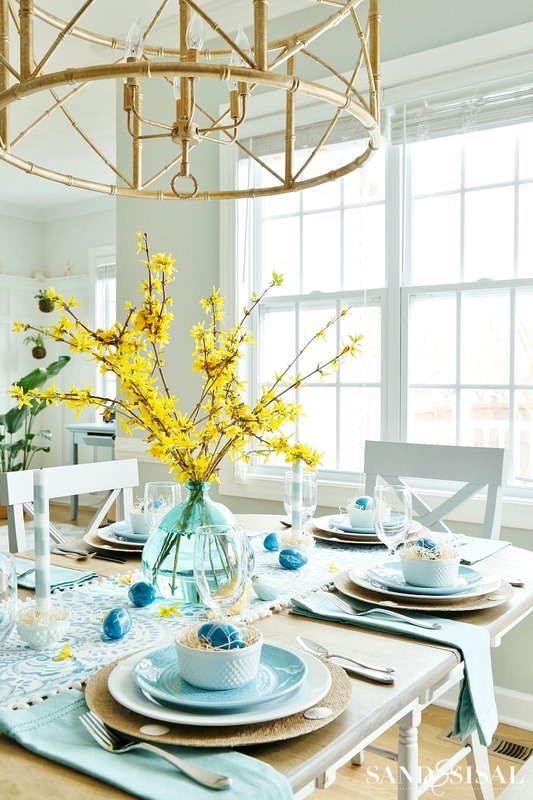 If you saw my recent spring home tour then you know that I’m having fun with shades of blues and pretty pops of sunny yellow. 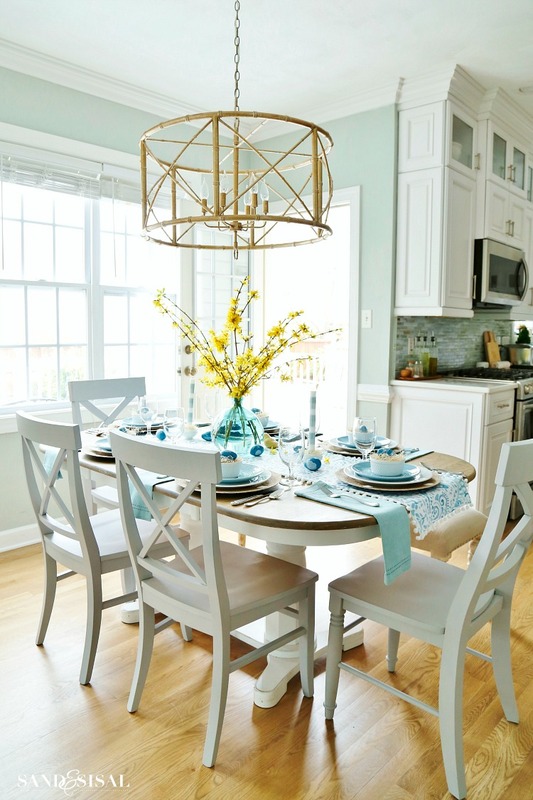 The cheerful color scheme is carried into our kitchen and dining area. 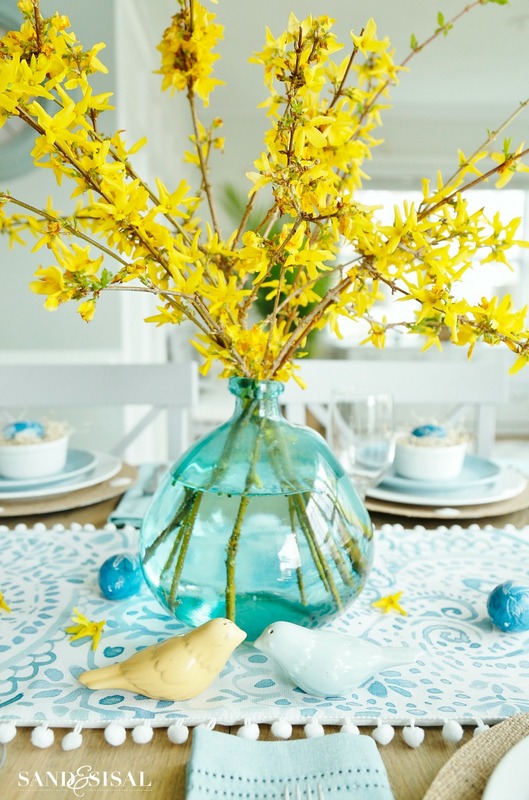 Today I’m sharing a aqua and yellow coastal Easter tablescape as part of a Styled + Set Holiday Entertaining Blog Tour hosted by Designthusiasm. If you are coming over from Citrine Living, welcome to my home! When it comes to decorating for Easter, I have shied away from bunny figurines and such. Infact, the only bunnies we’ve ever owned have been in the form of a stuffed animal or made out of chocolate. And the chocolate ones all met their delicious demise… hee,hee. Maybe my bunny avoidance over the years was to try to keep the commercial aspect to a minimal and instead focus on the real reason for the holiday, the celebration of Christ’s resurrection and the gift of forgiveness and new life. For the tablescape, I was thrilled to have spent less than $10. The pom-pom trimmed table runner is from HomeGoods and ok, those little pom-poms remind me a bit a fluffy bunny tales. Will that suffice? 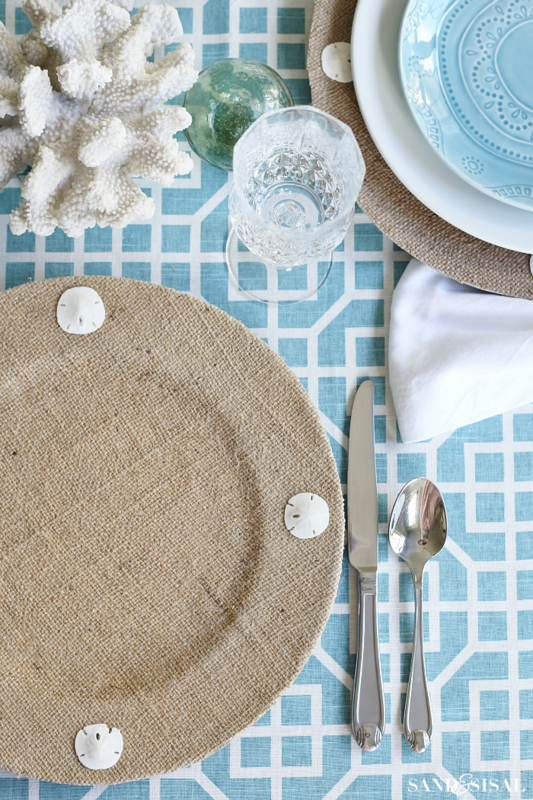 I pulled together items I’ve owned to create a cheerful table setting with a bit a of coastal touch, of course. The whimisical striped candles were a late winter find at Target and go so lovely with the table runner. All of the dishes are also from Target which I’ve collected over the years. Unfortunately they just stopped carrying the aqua salad plates. They all look so pretty on the Coastal Burlap Chargers. 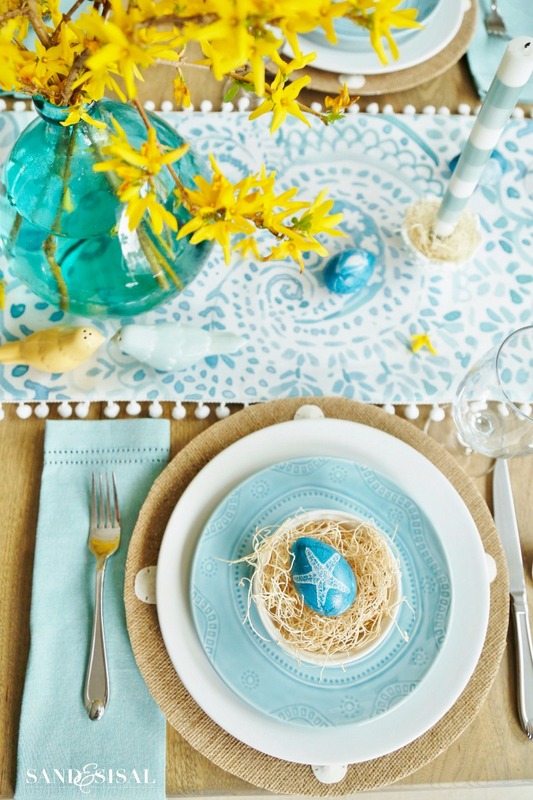 And my favorite addition to this year’s aqua and yellow tablescape are the Decoupaged Coastal Easter Eggs which are sprinkled across the table and nestled in individual ramakin “nests”. 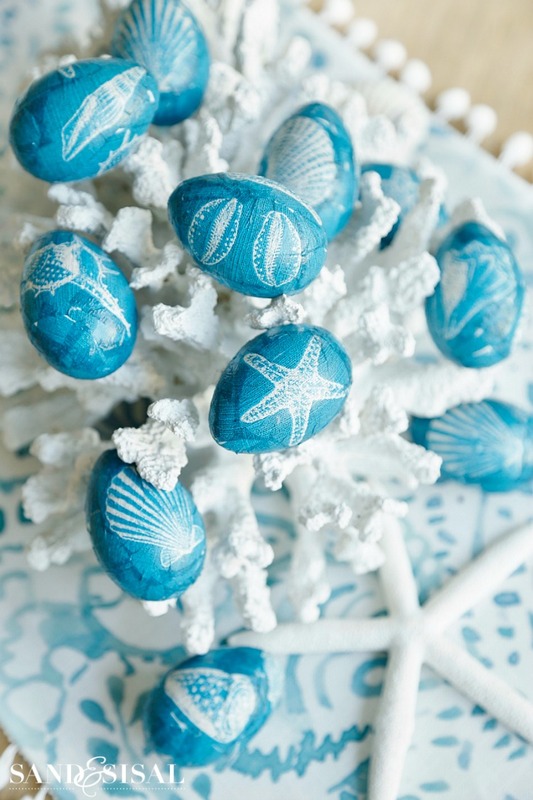 Learn how to make the coastal eggs HERE. They are so easy! The beachy burlap chargers are even easier to make. Click HERE for the tutorial. 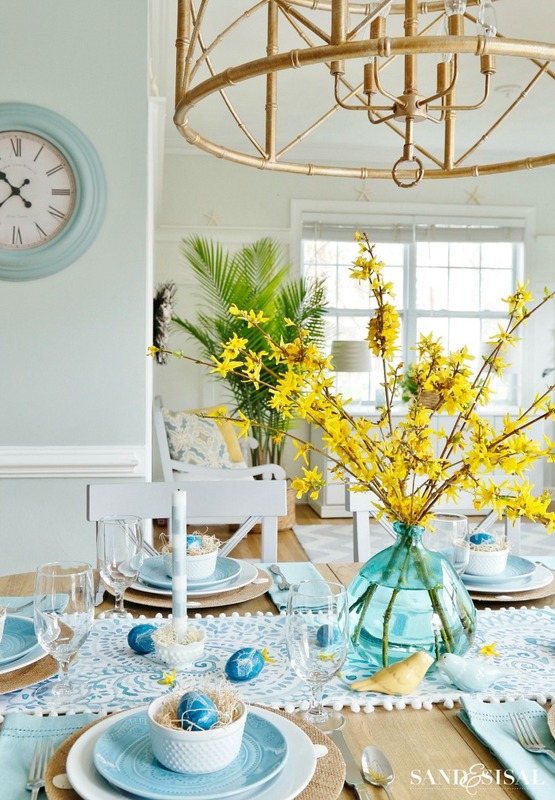 Our forsythia bushes are in full bloom and clippings from it make a simple and lovely Easter centerpiece. My house is filled with forsythia at the moment! Aren’t the little bird salt and pepper shakers adorable? Those too were from Target a few years back. Here is a different angle I don’t show too often. This console table has baskets underneath which holds all the kids’ shoes, so I’m sparing you the site of the muddy soccer cleats spilling out. The basket is our little drop station where keys and sunglass are usually tossed. It is clean at the moment thank goodness and looks pretty with the two Easter Egg Topiary Trees. I had the topiaries on a past Easter table. 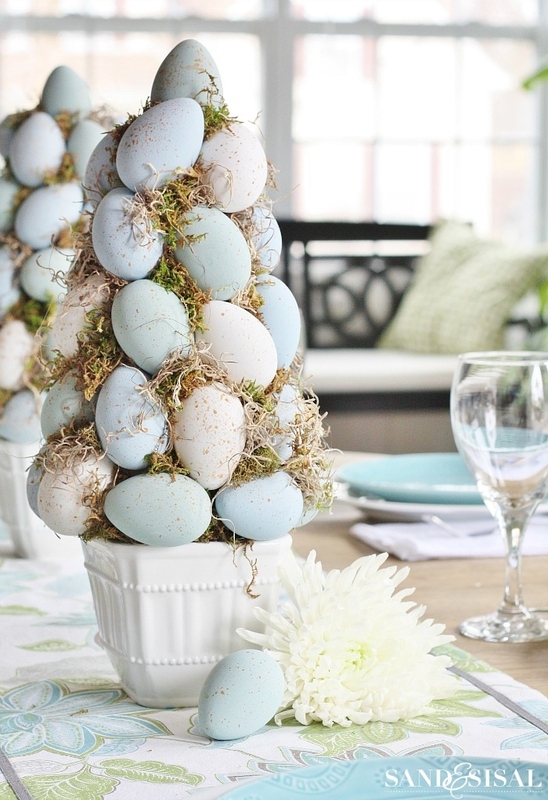 Learn how to make your own Easter Egg Topiary Trees HERE. I’m still enjoying having the dining room chairs in the kitchen along with the linen nailhead bench. I’m not sure when or if I’ll move them back into the dining room even! 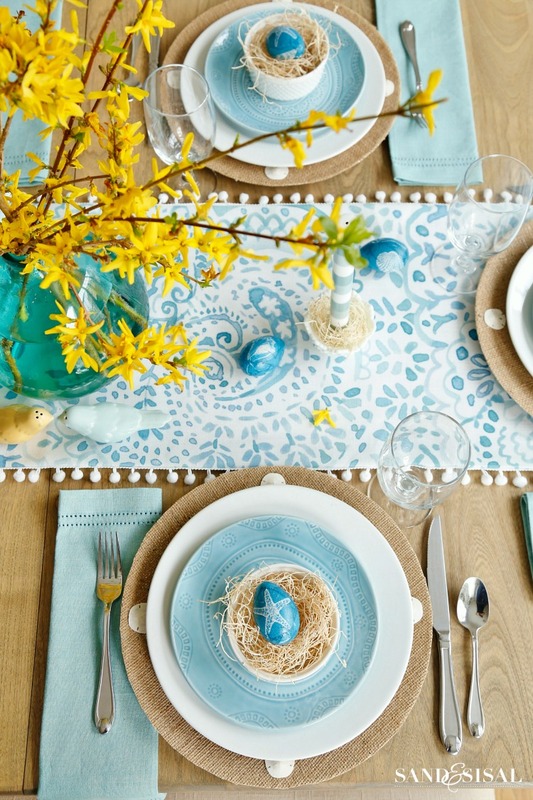 I hope you enjoyed our simple and cheery aqua and yellow coastal Easter tablescape! Next up on the tour is French Garden House, be sure to check out her lovely home and all the homes on the tour are linked below! Just beautiful! Aqua is my favorite color and mixed with the yellow makes it pop. 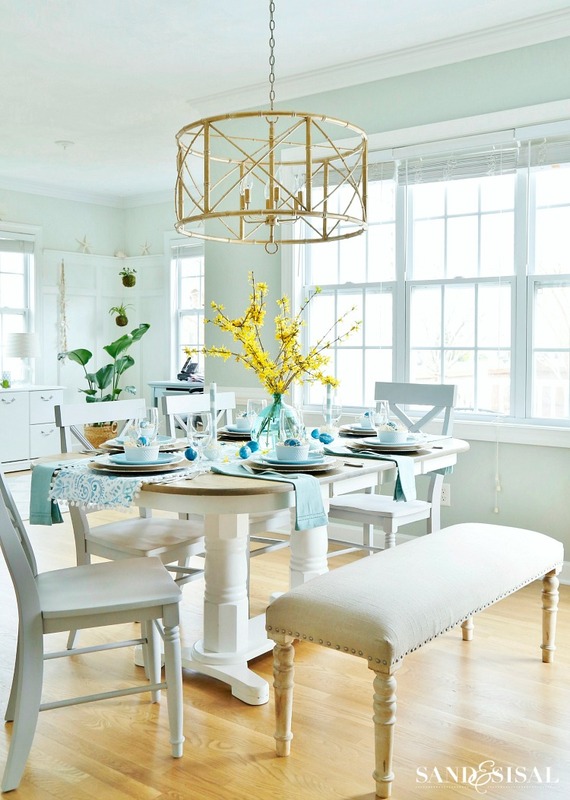 Kim what a gorgeous table – I love your vibrant colors so much, they bring so much life to your already gorgeous home! And your chandy is spectacular!! Thank you Tamara! I smile everytime I look at that chandy! 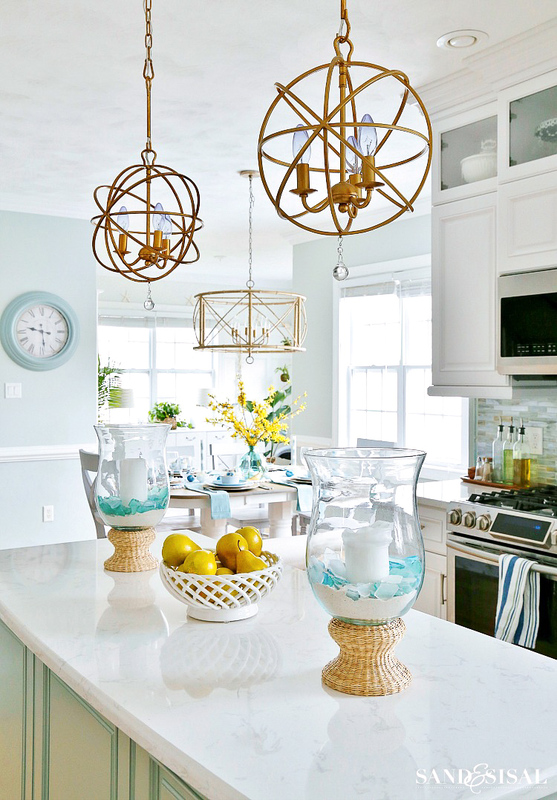 Wow, I am l-o-v-i-n-g those beautiful hurricane candle holders on your kitchen island. I may have to add some sea glass to the really plain hurricanes I have as well. The color just makes them pop! Thanks for a great idea. Also, that table runner is absolutely gorgeous — just brings the whole table to life and pulls everything together. You really have a nice touch with decorating, making it look simple, elegant and easy. Thankk you Debbie! What a lovely comment! I picked those hurricanes up at Kirklands a few years ago but they have carried them in store each summer. 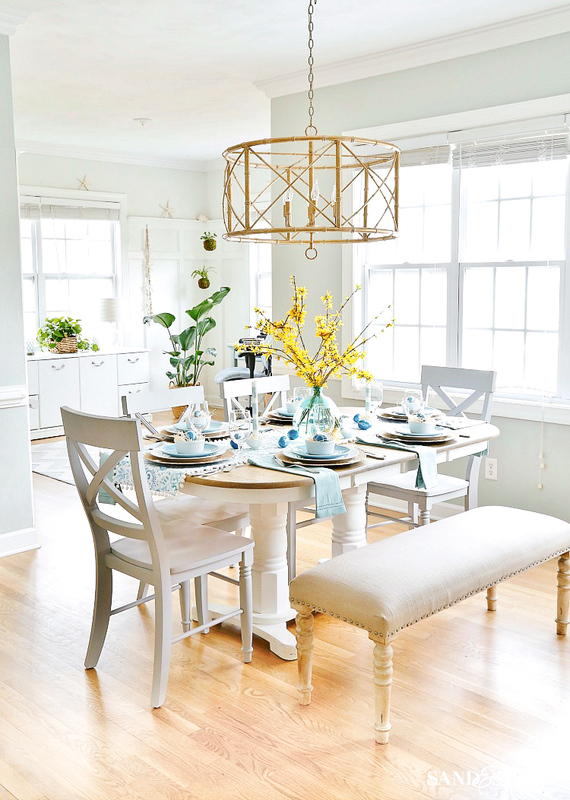 Kim, I absolutely love your sunny table and the lovely aqua blues! 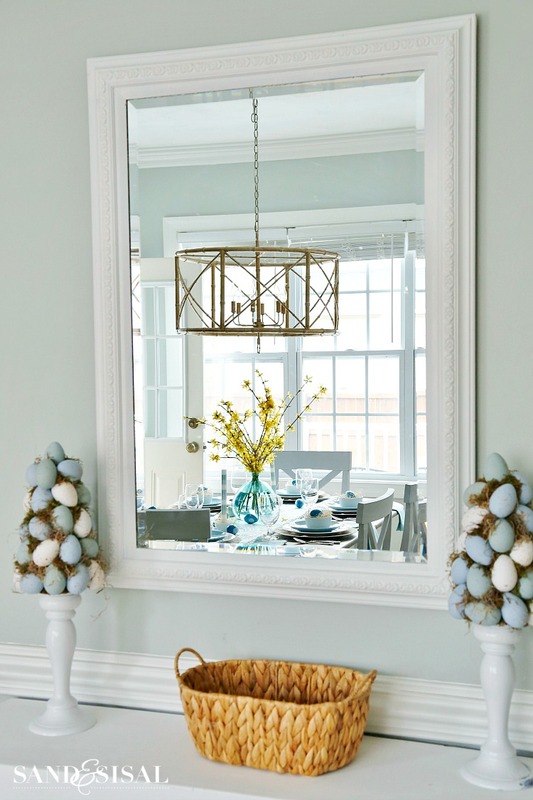 It works perfectly in your sun-filled space and mix of pale aqua tones with the richer blue eggs is wonderful. And then that surprise pop of yellow – just great!! Thank you so much Lory! 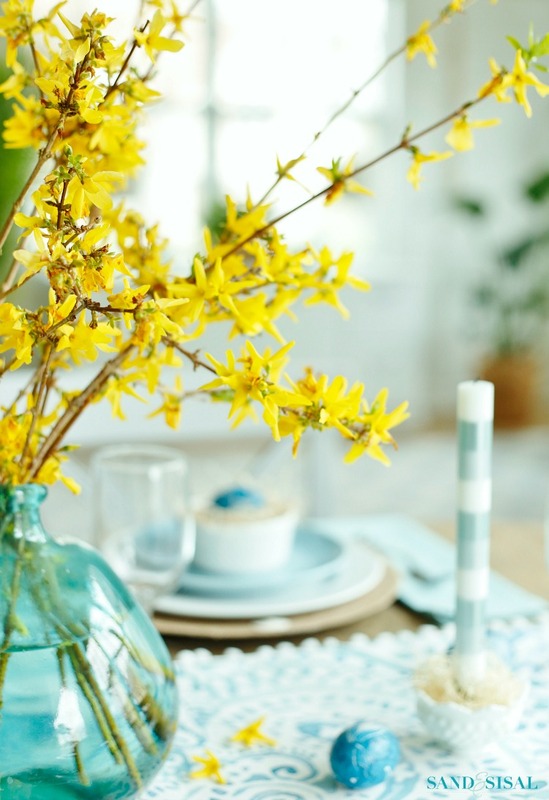 I love everything about this table setting – the Springy airiness, the aqua and yellow, the centerpiece vase!, the runner is beautiful – all so pretty!! I’m new to your blog, so you may have talked about this before, but could you share the information on your kitchen table, please – manufacturer, style name and where you purchased? Thank you! Thank you so much Lidy! Everything is so lively and elegant. Thanks for sharing. Thank you Marilyn! Have a lovely week! Kim, I love this table and recently just picked a gray, aqua and yellow color combo for my grandkids bedroom (boy and girl). Love this! Where are your orb chandeliers from? I may have to rip up my (plaster) ceiling to add two! Hi Nancy! Thank you so much! I bought those online from Ballards Designs. They come in several sizes and in a few finishes and were quite affordable. So beautiful! Aqua is one of my favorite colors. And the white pattern on the egg is so cool. 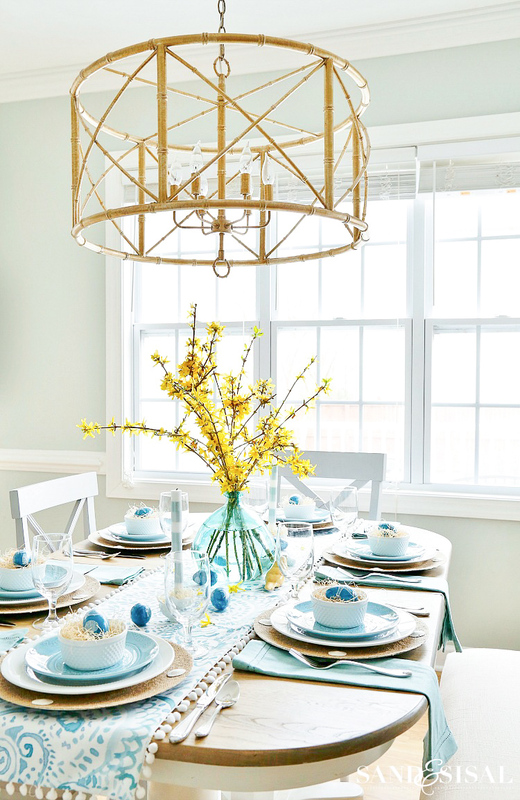 Love the aqua color scheme, your entire house is beautiful. Can you please share your paint colors for all the rooms? Also, if any of them are sea salt, what direction does the room face? I’ve tried samples of that color, but it always looks dingy grey to me.